LOCATION.--Lat 41`50'25", long 76`49'38", Bradford County, Hydrologic Unit 02050106, at single-span concrete bridge on secondary road, 1.4 mi upstream from mouth and 1.5 mi west of Columbia Cross Roads. PERIOD OF RECORD.--September 1962 to September 1968; October 1968 to March 1981(partial record); May 2010 to current year. GAGE.--Water-stage recorder and crest-stage gage. Datum of gage is 1,136.56 above National Geodetic Vertical Datum of 1929. 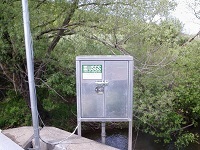 Prior to May 13, 2010 water-stage recorder at datum 1.0 ft higher. Satellite telemetry at station. COOPERATION.--Station established and maintained by the U.S. Geological Survey. Funding for the operation of this station is provided by Repsol Oil & Gas USA.